While we were delivering books to Pine Ridge Reservation, we received an email from Brian, founder of Simply Smiles, an NGO that supports Cheyenne River Reservation. He said, quite simply, “Cheyenne River Reservation is only about 4-5 hours from Pine Ridge. In South Dakota, that’s like going out for a cup of coffee…” Well, we kind of laughed about that, because after spending some time in South Dakota we knew what he meant. It takes hours and hours to go from one place to another, and as noted by Emma, you can never use the GPS. Only a map will work. After ditching our trailer, and packing our Suburban to the top with boxes of books, we decided we were up for the challenge. We restocked our peanut butter and jelly, refilled our water bottles, and set out on our journey. We did run into a 30-minute roadblock of one car, not that unusual we found, and, of course, miles of empty, sandy roads. Visiting the Simply Smiles community center, located in Sam Different Horse’s community building on the Cheyenne River Reservation was amazing. Brian and Zachary and their team are welcomed into the Lakota culture. The volunteers all have close relationships with the community. The wind blew incessantly, but fortunately the community center had one indoor room and we were able to set up a series of folding tables and create an entire room for our “free” book fair. The kids were really excited and grabbed as many books as they could carry. That evening Simply Smiles was hosting a reservation-wide dinner. All the parents and grandparents were able to also come and choose books for their families. One woman shyly asked if she could keep some of our better-conditioned cardboard boxes to use as furniture to store her clothing in her new home. We were humbled by this simple request. Simply Smiles imports soil and has created functioning gardens that produce enough food to feed a substantial portion of the local community. The greenhouse was built when Simply Smiles volunteers and Lakota Indians worked together. Zachary explained how difficult it was to stretch the plastic sheeting over the metal hoops and secure it down while battling the constant wind. We could barely imagine. The paper flowers are remnants from the previous night’s decorations when the greenhouse served as a teen dance hall. Here in South Dakota, as we wandered on and off of the reservations, in search of the correct entrance to Pine Ridge Reservation, we discovered that our cell phone services and online maps let us down. We learned this only after driving hours through undulating lands surrounded by miles of prairie grass and getting lost after driving hour upon hour in the wrong direction. Learning opportunity! We had to drag out this huge Atlas, which I hadn’t seen since I was 3, when they were still being used, to navigate where we were going. On the upside, notice there is no problem pulling over on the highway and standing in the middle of the road, bare foot discussing our next move! We were thrilled to see some friends from back home, and we were welcomed with a picnic lunch and water bottles. After that it was time to get to work. We decided to set up the books over 3 picnic tables so that the children could choose their own books. Here it may look like Quinn is being lazy, actually he is holding onto the books to keep them from blowing away in the constant wind! and watch them collect more and more. We also got to play with the children on the playground, and in a game of kickball. It was really saddening playing with these children, and then learning of their unimaginable situations at home, yet it helped us to understand why the children were so grateful, and it continued to motivate us to help them more. 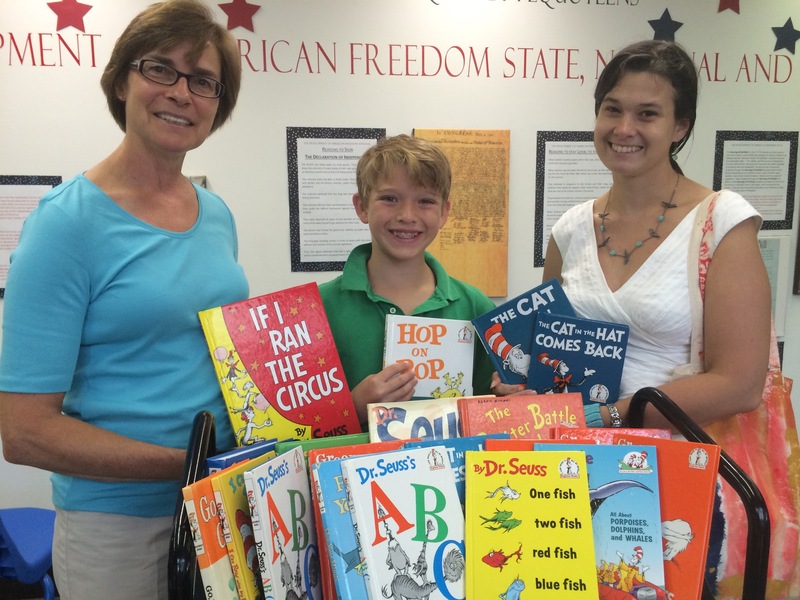 We were inspired by the determination of this lovely girl to bring home a boxful of books for her younger siblings. We hope to follow her example! This past week, Pequot Library held its annual book sale. Pequot Library’s annual book sale has been dubbed the biggest and the best book sale in New England. For the last four years, Wonderland BookSavers has run a “Lemonade for Literacy” stand during the book sale. 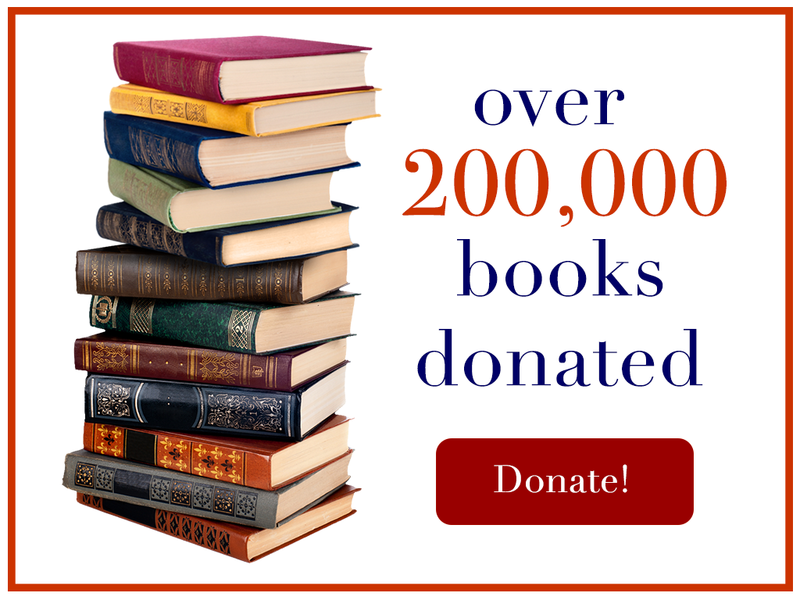 The purpose of Lemonade for Literacy is to raise donations to purchase books from Pequot Library’s book sale, and then donate those books. The books we obtained this year via Lemonade for Literacy and Pequot Library’s book sale will be going to South Africa, Zimbabwe, and Ghana. To prepare our stand and concessions, we spruced up some of our old signs and banners and created some new signs with recent pictures of our service work so customers could see the children we serve. Each night, we baked new batches of brownies, cookies, and rice crispy treats. Every morning before we went to the library, we made a new batch of homemade lemonade. We arrived at the library in the late morning each day to settle ourselves and set up our stand. We propped up a piece of plywood as a table on top of wooden crates, and then swept a yellow and white table cloth over our table. Next, we put our cooler filled with our ice cold lemonade to one side of our stand, and we arrayed our baked goods across the rest of the table. Instead of having fixed prices on our commodities, we had all our goods priced by donation. We ran our stand from about 11 AM to 4 PM each day of the book sale. We had many customers, but during the slower times of day, we passed time playing Apples to Apples, UNO, and reading books. On the last day of the book sale, instead of running Lemonade for Literacy, we selected books from inside the expansive white tent, and then used our $212.50 that we raised through our lemonade stand to purchase 1,500 books. Through our Lemonade for Literacy stand, we were able to benefit our longtime community partner Pequot Library while collecting books to donate to children in Zimbabwe, South Africa and Ghana. Last week, WBS team members Madeline, Claire, Emma and Brooks Morgan led a medieval art workshop at Pequot Library. We examined medieval literature, reflecting especially on the process of creating manuscripts. We also instructed on how to create illuminated manuscripts and write in different cursive styles. Additionally, we read medieval stories and taught Roman Numerals and the medieval calendar system–which operates by recognizing certain days and showing the distance of regular days from the special days to account for time. During the Middle Ages, manuscripts were one of the few viable ways to preserve information. These books were created by first making parchment. The process of making parchment consisted of first obtaining goat or cow skin. Next, the skin would be soaked in water and lye and cleaned to remove any fibers. The skin would then be stretched to dry, and lastly, the skin would be cut into pieces of parchment. The parchment would then be sewn into gatherings, and the gatherings would be bound into a book. Lastly, clasps would be added to keep the book shut and protect the manuscript. Then, scribes would embark on the lengthy process of copying information into the book, and illuminating certain letters. Lastly, any images would be drawn or painted and the book would be complete. On the first day, we along with Beth Beaudin, the Special Collections Consultant of Pequot Library, surveyed the process of manuscript making. We also began to teach basic cursive to the children. Every day we had a snack and recess break, where we played “discus” (frisbee) and “Bubonic Plague” (the game infection, where one person is “it”, and they along with people who have been tagged tag others until only one person is left). We also played “capture the crown”, which was our medieval version of capture the flag. During the second day we introduced calligraphic cursive styles and how to write in medieval handwriting. The children transcribed poems and also practiced writing their names. We taught the children about the medieval calendar and how to use Roman Numerals. Towards the end of the day, everyone began creating the skeletons for their illuminated letters. We also visited The Birds of America, a book by John James Audubon with a compilation of life-size, chromolithographic American birds. For the third day, we focused on nobility, coats of arms, and finishing the illuminated letters. Everyone was able to design and create a coat of arms to wear which represented their interests or personality. The zenith of the week was being able to examine a book made in 1190–the oldest book in Pequot Library’s collection. The manuscript was a letter from Pope Gregory on proper behavior and conduct. We also had a guest speaker come and teach about Shakespeare, and we acted out scenes from A Midsummer Night’s Dream. On the final day of camp, everyone made crowns and armor, finished the cursive books which we began on Monday, and reflected on everything learned during the week. The children collected their amassed number of projects, crowns, letters, books and sheets, and we headed out to play our final game of “capture the crown”. It was incredible to immerse ourselves and other children in medieval studies, and we will look forward to continuing the medieval theme with the reading program this summer at Pequot Library. Last Friday, Team Wonderland BookSavers attended a “Meet the Author” event with Ida Siegal, an author of a series of four books, at our local library. Many of us have seen Ida broadcasting news stories as an NBC New York reporter, but we were unaware that Ida also wrote children’s books. Ida recently published Emma Is on the Air, a series of four books in which the protagonist, Emma, pieces together puzzles and mysteries at her school and reports on the subsequent happenings. Ida explained that she wanted to create a series of books to illustrate what reporters do. As she spoke to us, she explained that children are always interested in news reporters–she recounted how whenever children see the iconic NBC peacock logo and all the news equipment, they immediately sprint over to ask a deluge of questions. Ida said she wanted to create something to show children what being a news reporter is like, and with the incite and perspective of being an actual news reporter, Ida created this series of books to help readers see how reporters operate. Ida read a few chapters from her first book from her series, Big News!, and after reading two chapters, Ida held a question-and-answer session where we and other children were able to ask about her writing process, her inspiration for the books, and how her career as a reporter helped in creating the story. Lastly, Ida held a book-signing, and we got signed copies of Ida’s book Big News! This event was both informational and inspiring, and we gleaned firsthand knowledge about news reporting and book publishing. 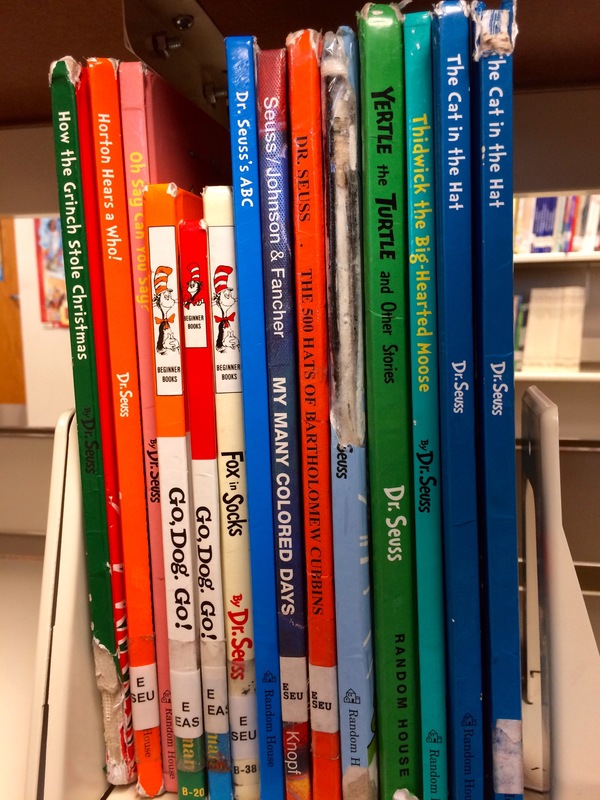 Some of you may remember this forlorn collection of Dr. Seuss books owned by a local school library. 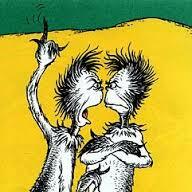 The librarian requested that we assist her with Dr. Seuss books for her collection. She stated, “Dr. Seuss is a favorite. The easy rhyme schemes are appealing to children and greatly aid early literacy efforts.” We posted the request on our home page and Pequot Library noticed! Pequot Library hosts an annual Book Sale for which it collects thousands of books. 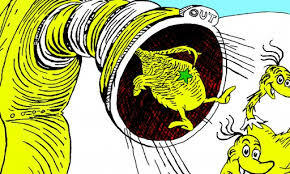 The Director selected multiple Dr. Seuss titles. The school librarian was able to purchase these books through the Bucks for Books program. 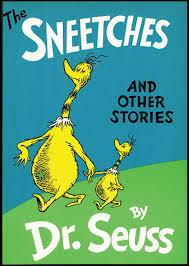 Look for our special Dr. Seuss reading program which we will be doing with both libraries this summer and fall, featuring The Sneetches and Other Stories from our One Book: One World program.